The phone boasts a massive 5000 mAh battery, which can last up to 2 days and can be charged in 15 minutes with its TurboPowerTM charger.1 The smartphone also has an immersive edge-to-edge 15.7cm (6.2 inches) Max Vision HD+ screen in 19:9 aspect ratio along with a storage capacity of 64GB expandable up to 256GB2 via a dedicated microsSD2 card slot. It packs 4GB of RAM, a blazing fast Qualcomm® SnapdragonTM 636 Octa-core processor, unlimited photo storage from Google photos. You also receive upgrade3 to the latest Android™ OS and stay ready with monthly security updates that help keep your phone secure. The 16MP +5MP dual rear camera system and the 12MP front camera makes sure every shot is your best, both allowing you to add a blurred background effect in real time. With the Android Pie update, the improved camera experience also allows for better low light photography, expert mode and panorama feature. The smart camera system with integrated Google Lens helps in recognizing and searching about the objects that you see. Find products online, copy and paste text, learn more about landmarks, add events to your calendar, look up movie posters, identify popular plants and animals, and more. The power-packed smartphone will now be available at just INR 14,999 with exciting offers such as a 10% instant discount* with HDFC Bank Credit/Debit Cards & EMI transactions, and No cost EMI available from Rs. 2,500/month. Furthermore, consumers can also exchange their old smartphone for a brand new motorola one power during the Flipkart Big Shopping Days Sale from December 6-8th. 1[Battery life & TurboPower™ Charger] All battery life claims are approximate and based on a standard mixed use profile. 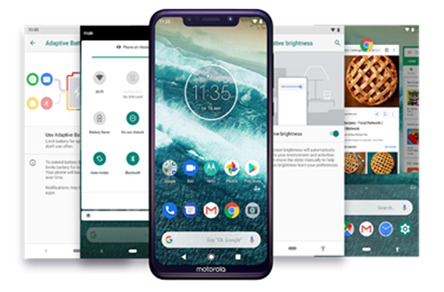 The mixed use profile is based on Motorola devices on major 4G LTE networks with excellent coverage and includes both usage and standby time. Out-of-box settings are applied to the mixed use profile to project battery performance. Actual battery performance will vary and depends on many factors including signal strength, network configuration, age of battery, operating temperature, features selected, device settings, and voice, data, and other application usage patterns. Battery must be substantially depleted; charging rate slows as charging progresses. 3 [Android™ upgrades and built-in security] The phone initially launched on Android O, and will receive OS upgrades to P and Q; security updates will be provided for three years from the initial global launch date of Aug 30th, 2018.